A finance “feud” as phony as pro wrestling… one reason more reason the feds will stand aside for legal marijuana… “Here we go again” with housing, says a reader… and more! Well, if you’re going to be wrong, you might as well be early too. That’s all we can think this morning as we chew on the news that Goldman Sachs is already out with its “top trades” for 2017. Readers with good memories will recall the 2016 edition was a debacle: Only 41 days into the year, Goldman had already chucked aside five of those trades. And the sixth was history by March. One of those trades is making a return appearance: “The bank says investors should again buy the dollar versus the euro,” says the Financial Times. The vampire squid is also counting on a weaker British pound, a weaker Chinese yuan, a stronger stock market in Brazil, India and Poland and good performance from 10-year Treasury Inflation Protected Securities. No, we’re not saying you should take the other side of those trades based on Goldman’s 2016 performance. Only that you shouldn’t expect an apology if the trades don’t work out. After all, having a taxpayer backstop means never having to say you’re sorry. Meanwhile, “a dangerous idea has taken hold in the financial services industry,” warns our trend follower Michael Covel. Maybe you’ve heard of it. It’s called “efficient market theory.” Or sometimes “efficient market hypothesis.” For our purposes today, we’ll call it EMT. “In essence,” Michael explains, “it says that market prices fully reflect all available information. The prices you see quoted in the markets include all information there is to be known about those assets. And any new information that comes out is immediately priced in. “The implication of this theory is that the market is rational. Inefficiencies are quickly remedied, so it’s not possible to consistently beat market returns. If you took a college econ course, chances are you had his textbook. And to reach people who didn’t take a college econ course, he had a regular platform in Newsweek at a time people still read Newsweek. Samuelson began preaching the gospel of EMT in the mid-1960s. “The academic theory Samuelson helped spread has become the cornerstone of modern finance and has transformed the financial services industry,” Michael says. 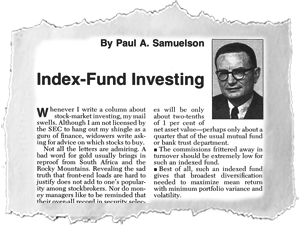 In 1976, Samuelson penned a Newsweek column that became legendary in financial circles. It sang the praises of investment funds that passively track an index like the S&P 500… and lamented that such funds were available only to big-bucks institutional investors. Forty years later, “passive” funds are all the rage for retail investors — as opposed to “actively” managed funds that try to beat the market. “For the past 14 years,” says Michael, “active equity fund managers have underperformed all benchmarks. These incompetent managers have helped cement the academic EMT case that you really can’t beat the stock market. Key point: “Passive index investing keeps you fully invested no matter what,” Michael warns. “We’ve seen two 50% drops on the S&P in the last 15 years. What’s worse is the market has historically suffered a downturn of at least 50% every 10 years or so. And get this: Paul Samuelson didn’t even follow his own advice. “Back in 1969,” Michael tells us, “Samuelson was founding partner of an investment startup fund called Commodities Corp. At the start, Commodities Corp.’s traders were firm disciples of EMT when trading commodities and stocks. But they turned out to be poor performers. In its first year, the fledgling company lost $100,000. To the markets, where the dollar is soaring and gold is getting crushed. At 101.8, the dollar index is up more than three-quarters of a percent to yet another 13-year high. That would be bad enough for gold, but sellers have taken control this morning, sending the Midas metal down $30, to $1,183 — a level last seen in early February. New home sales: This one is a disappointment — down 1.9% for October when the Street was expecting a nearly flat number. In contrast to the dollar and gold, the stock market is barely budging after another day of record highs. Today it’s blue chips taking the lead with the Dow up slightly and small caps taking a back seat with the Russell 2000 slipping. Crude is up 19 cents, to $48.22. “Markets are holding their breath waiting for clarity from the Trump economic team,” says Jim Rickards. “The stock market rally is clearly attributable to the Trump mix of lower taxes, less regulation and more government spending. The drawdown in gold is clearly attributable to the expectation of higher interest rates” — and the stronger dollar that would result. But there are tensions within Team Trump, says Jim: “Some advisers, such as David Malpass, favor fiscal discipline. Others, such as Steve Bannon, have spending plans that point to much higher deficits. Still other advisers, such as Larry Kudlow and Art Laffer, favor tax cuts. Higher spending and tax cuts will lead to much higher deficits. “The contradiction between the fiscal discipline of Malpass and the fiscal stimulus of Bannon are not the only contradictions. Kudlow and Mike Pence favor free trade, while Malpass and Bannon agree on the need to renegotiate trade deals. And so on. “Sitting on the sidelines is the Fed,” Jim goes on. “If the Fed accommodates big spending and higher deficits, then inflation is on the way. That’s great for gold. If the Fed raises rates to lean against inflation, they may cause a recession. That’s bad for gold in the short run but sets up a global recession and major debt default by emerging markets. That will lead straight to a global liquidity panic, which will put gold on an upward path again as part of a flight to quality. 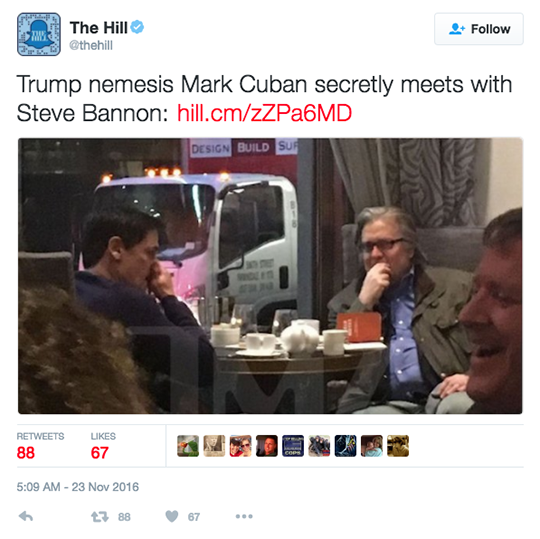 We said it in private office conversation but, alas, not here in The 5: The whole Trump-Cuban “feud” this fall was a reality TV stunt. And now that Trump says he’s no longer interested in prosecuting Hillary Clinton, how much longer until he and Slick Willie play a few rounds of golf again? “Dave, IMO there’s a compelling reason our federal government will give pot the all-clear going forward,” writes a reader: “because stoned citizens are easier to fleece — and drive into serfdom — than sober ones. “I’ve been in banking for 20-plus years,” says another reader email we’ve gotten on the housing market. “I was an underwriter prior to 2008. Now I have been a foreclosure specialist since 2009. I have rental houses financed with Wells Fargo. For years, I have been getting refi letters. Finally, this month, I got some to refinance with HARP. No income verification, no appraisal, no minimum credit score. “Now, granted, I’ve had the mortgages there since ’08, never missed a payment and have impeccable credit, but so did most people in the early 2000s. P.S. U.S. markets are closed tomorrow for Thanksgiving Day, and Friday’s trading day will be abbreviated. The 5 will take its customary long weekend and return on Monday. Our best wishes to you and yours!